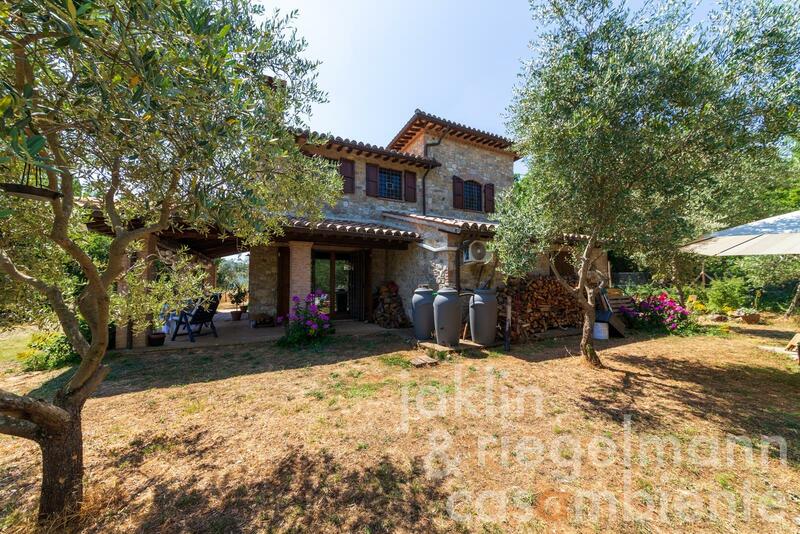 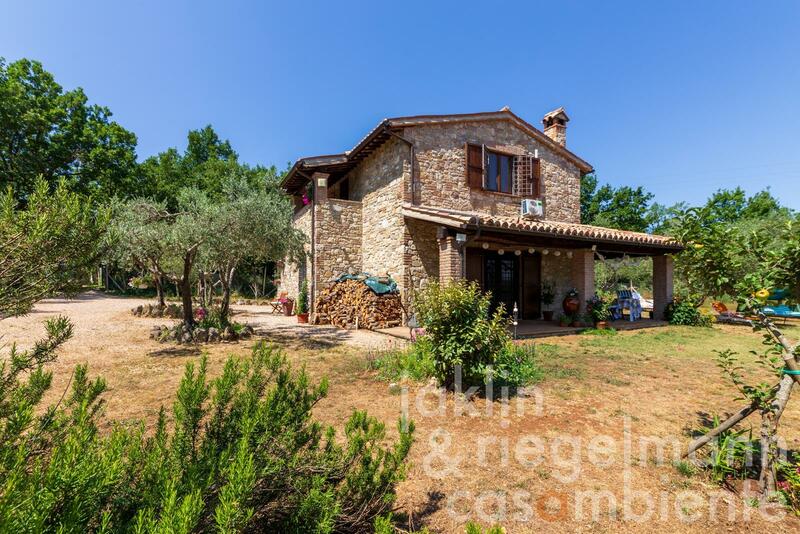 This Italian countryside property for sale is situated in the centre of Umbria, halfway between Todi and Montefalco, in a very scenic hillside location and close to an ancient and charming village. The house is built on two floors, with an internal and an external staircase which connects them, and a beautiful, spacious L-shaped covered terrace (approx. 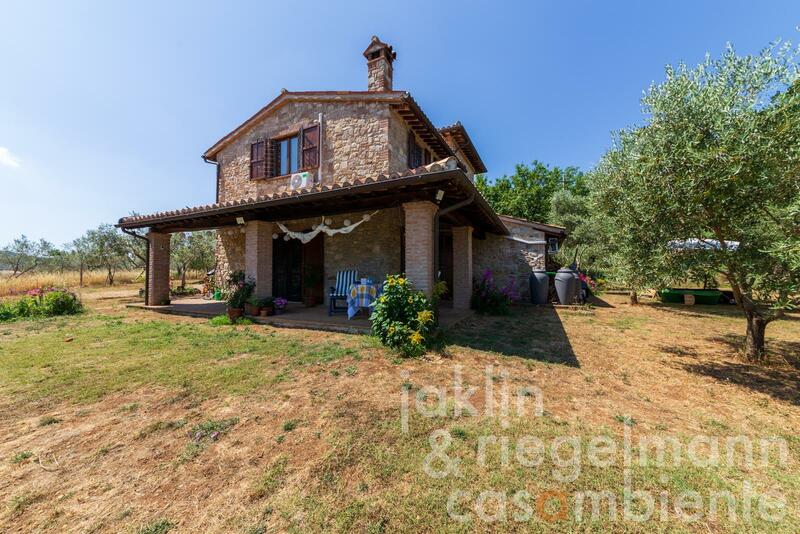 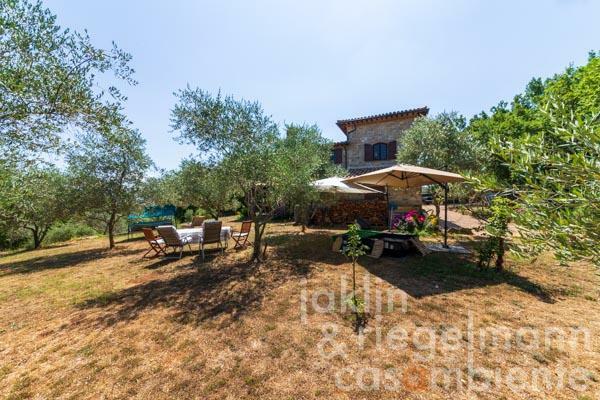 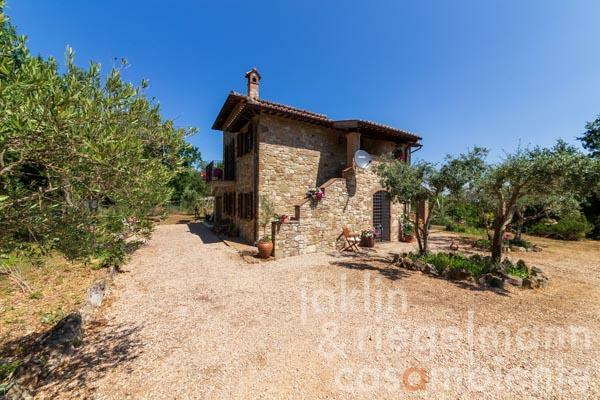 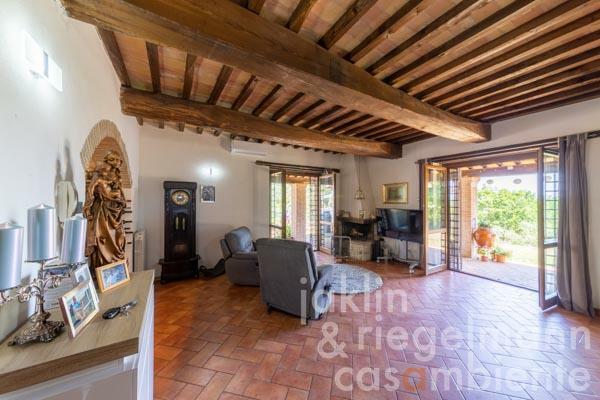 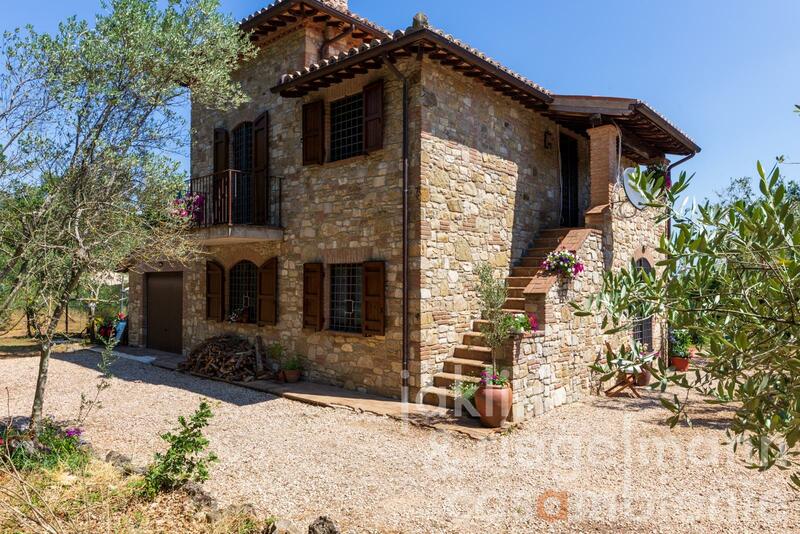 30 m²) overlooking the garden with views up until Montefalco. 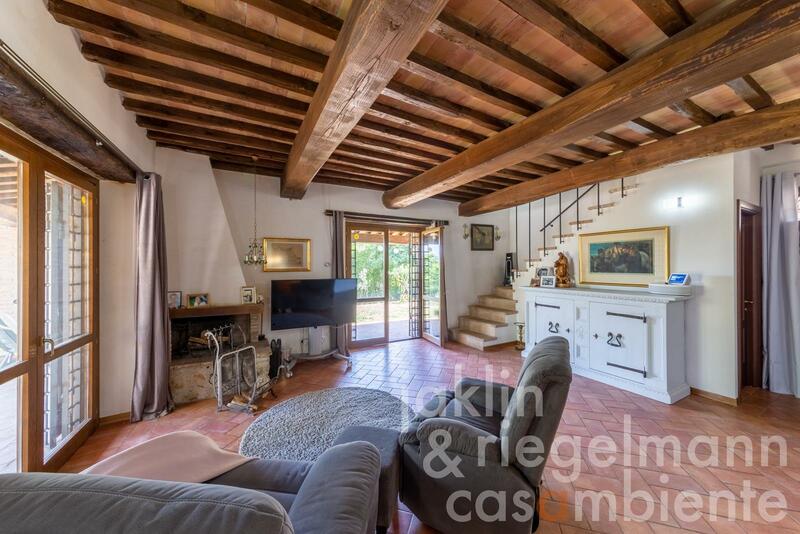 The house was newly built some years ago but reflects the typical characteristics of the Umbrian countryside with stone walls and ceilings with wooden beams. The approx. 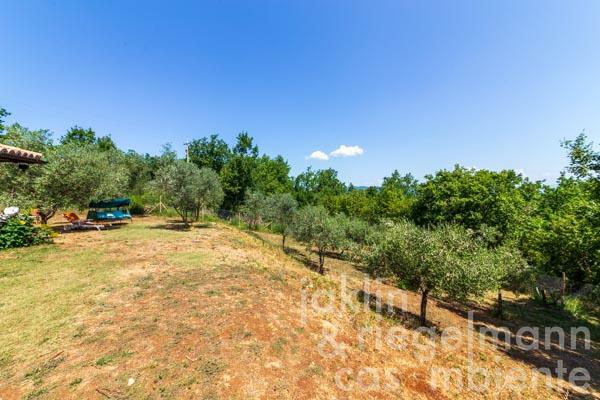 5,000 m² of land are mainly flat with various olive trees, some woodland with impressive oak trees, and a large lawn area, which is ideal for building a pool. 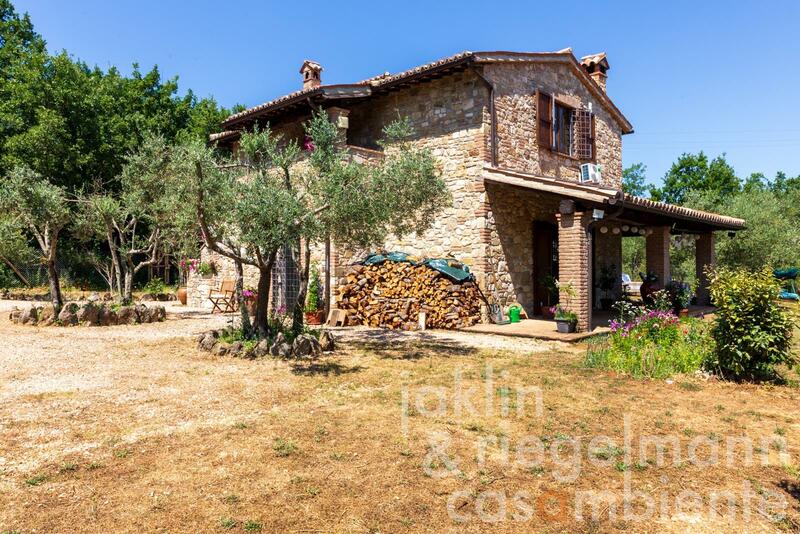 The property is within easy reach of many of Umbria’s cultural and natural sites: Montefalco and Todi are approx. 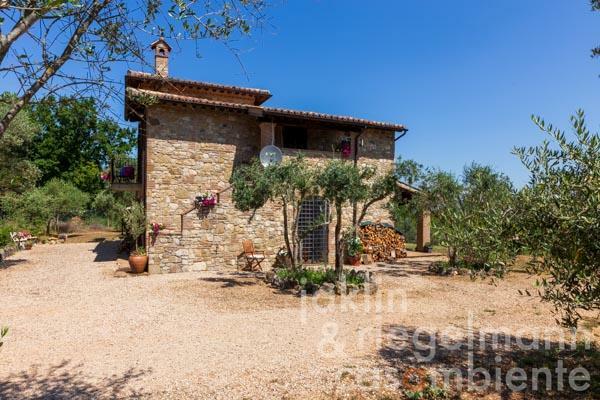 15 km away, Spoleto and Foligno can be reached in half an hour and Perugia with its international airport in 40 minutes by car. The Monti Martani, ideal for trekking and mountain biking, are just 10 km away. 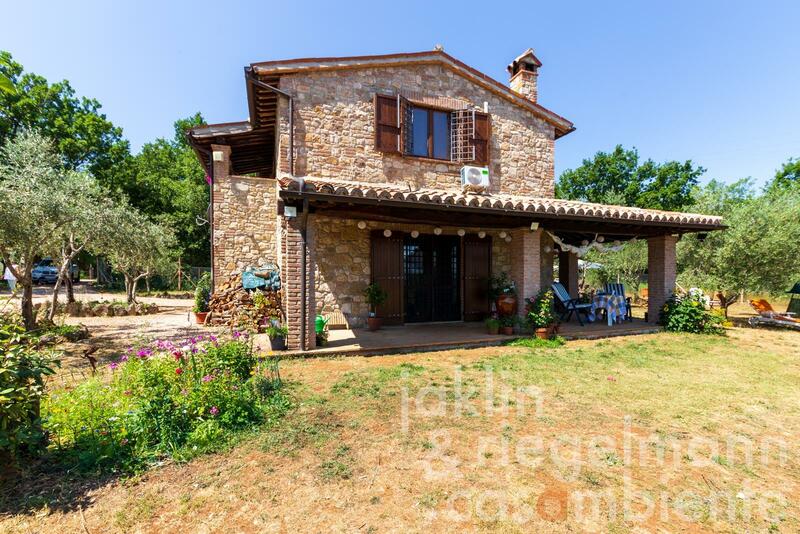 The village is at walking distance and offers a little supermarket and a bar. 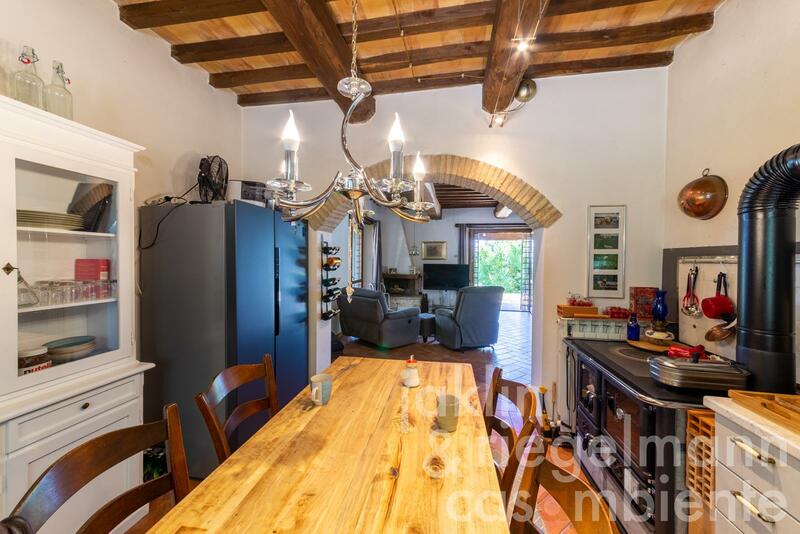 A beautiful country hotel with a SPA and restaurant is also situated in the neighbourhood. 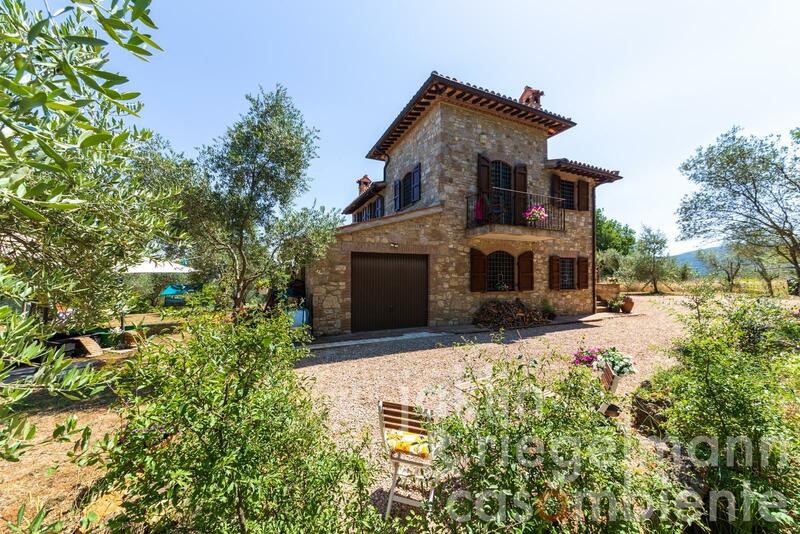 The house has a total area of approx. 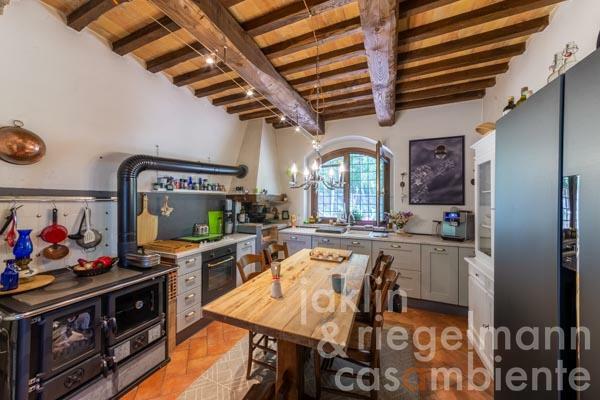 176 m² and includes the living area on the ground floor with a large living room with fireplace and access to the covered terrace, a traditional fully fitted eat-in kitchen and a bathroom. 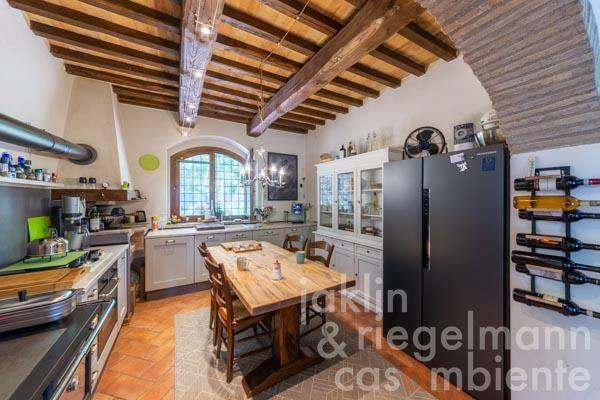 There is also a garage on this level. The first floor can be accessed via the internal and external staircases and offers three bedrooms and two bathrooms (one en-suite). Distances: Basic store and bar 500 m, the next town with most amenities 5 km, Montefalco; Todi 15 km, Foligno (main train station) 25 km, Spoleto 33 km, Perugia; Assisi 40-45 km, Lake Trasimeno 50-55 km. Airports: Perugia 47 km, Ancona 139 km, Rome 163 km, Florence 219 km. Italy, region Umbria, province Perugia. Electricity, central heating, fireplace, garage, private parking, garden.